Liquidiser jug graduated to 1200ml. The Kenwood FPP215 Food Processor is a small, fast and stylish food processor that will fit the smallest of kitchens. The in-bowl drive is easy to use while all detachable parts can go straight into the dishwasher. It comes with a slicer, cutting blade and whisk tool making it the perfect chef’s aid. A range of accessories are available separately. There’s a safety interlock to make sure the motor doesn’t start until the bowl lid is firmly fixed in place and the cable stores under the machine for a neat worktop. In a brand new design, the Multi-Pro FPP214 is all you need for chopping, grating, whipping, blending and breadcrumb-making. 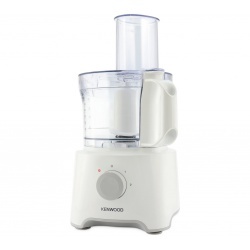 Using exclusive technology, Kenwood have developed a combined food processor and liquidiser which, thanks to a unique Dual Drive system, can both be used on the same compact base. The space-saving design hides a powerful 750W motor, a safety interlock means the motor will only start once the processor or liquidiser are securely clicked into place, it operates with the turn of a dial, is easy to clean and includes a host of fabulous attachments. Coarse slicing/shredding disc for cheese and vegetables. 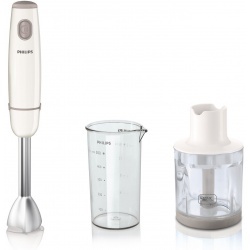 The Philips HR1605 daily collection hand blender combines 500 Watt power with a uniquely designed blending foot and chopper accessory. Providing a wonderfully smooth result for soups and chopped herbs. 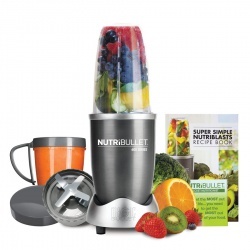 Preparing healthy food has never been so easy! With the Philips hand blender's 2-button release system it is easy to remove the blending bar for easy cleaning. It also has a single switch for easy use. and a slim-grip to fit any hand. 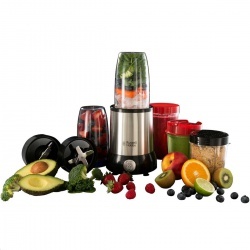 The strong 500 Watt power motor means it can handle even the toughest of ingredients. Developed together with the prestigious Stuttgart University, Philips ProMix is a unique, advanced technology that uses a specific triangular shape to create optimal food flow and maximum performance for faster and more consistent blending. This useful kitchen accessory will quickly take care of all those slicing, chopping, whisking and grating tasks, so that you have more time to cook and serve great food. The sharp, stainless steel blade will cut through those little everyday preparation jobs in no time. There is a safety interlock to make sure the motor doesn't start until the bowl lid is firmly fixed in place. This Philips Daily Collection Food Processor has a compact design including a 2.1 litre bowl and a variety of high-performance accessories. Preparing delicious homemade food has never been so easy! 2 speed settings and pulse for maximum control. 40% larger feeding tube (compared to Philips HR7625). 650-Watt motor for powerful processing. Up to 5 portions in one go. Emulsifying tool for cream and egg whites. High-performance stainless steel disc inserts. PowerChop technology for superior chopping performance. No mess from the centre of the bowl due to lack of inner shaft. Sharp and strong stainless steel S blade for chopping. The Kenwood FDP301 is perfect for homes with limited space but want to prepare great tasting dishes. The variety of attachments mean you can create tasty soups, gravies, cake mix, pancakes and much more without taking up all your counter space. 800w motor for quality optimal performance that lasts. 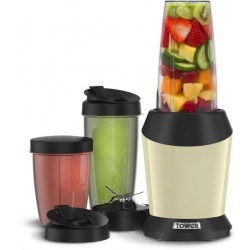 2 speed option plus pulsing; ideal for blizsing soups and smoothies. Compact space saving design makes it ideal for any kitchen. Includes Stainless steel knife blade, emulsifying tool, reversible slicing and shredding disc and a 2.1L bowl capacity. Do you love making homemade smoothies, soups and sauces, but you’re sick of the bulky blender taking over your kitchen counter? Then the EasyPrep Jug Blender is the solution for you. Its clever design that allows the jug to be flipped over and stored over the base, means you can save 1/3 of its height- ideal for if you’re short on cupboard space. It's easy to use buttons, with no complicated displays, means you can return home from the gym ravenous and swiftly blitz up a quick and delicious soup to curb your hunger! We all know making your own smoothies, dips or soups can be messy business, which is why we designed our EasyPrep Jug Blender to be easy cleaning. It doesn’t matter if your hands are covered in hummus or you’ve spilt some of your strawberry smoothie down the side of your blender! Its flat and easy to clean buttons ensure you can simply wipe away any spills with complete ease.